The annual New Mexico Communication Contest recognizes excellence in print, broadcast, electronic or Internet media, photography, marketing, public relations, graphic arts and journalism in New Mexico. 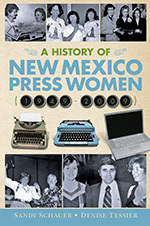 Contest winners are announced in spring and awards are presented at New Mexico Press Women’s annual banquet. First place winners advance to the national contest. The purpose of the contest is to improve professional skills by recognizing excellence in communication. The message is what is important. The message — how well it communicates, how it is directed to its target audience, how well it achieves its objectives — is the judging standard. Finalists and winners of book categories in the Communications Contest may now order stickers. The stickers do not have a date, so previous finalists and winners can use them. The cost is $21.00 for 100 stickers. Order stickers at https://squareup.com/store/new-mexico-press-women. All nominees must be living members, in good standing for at least two years in an affiliate and NFPW (To check on a member’s status, please e-mail treasurer@newmexicopresswomen.org). For more information, contact NMPW COA Chair Bud Russo. All nomination packets must be received by December 31, 2018. The COA Award winner will be announced at the NMPW Award Banquet on during the 2019 Conference in Albuquerque, New Mexico. The Zia Award started in 1953 to honor an outstanding woman in New Mexico media. Each year the award rotates to one of three categories: non-fiction, fiction, and children’s literature. To accommodate this schedule, a book published in the last three years is eligible. For information about the current contest, click here. Finalists and winners of the Zia Book Award may now order stickers. The stickers do not have a date, so previous finalists and winners can use them. The cost is $21.00 for 100 stickers. Order stickers at https://squareup.com/store/new-mexico-press-women. The NMPW High School Communications Contest is part of the National Federation of Press Women High School Communications Contest. It inspires students to do their best work, which earns them recognition and reflects well on their teachers and advisers. Students may enter work in one of 20 categories including: Editorial, Opinion, News Story, Feature Story, Sports Story, Columns, Feature Photo, Sports Photo, Cartooning, Review, Graphics, Single-Page Layout, Double-Truck Layout and Environment. First place winners continue to the NFPW High School Communications Contest and will compete with students from all over the country. Professional journalists judge all New Mexico entries and provide written comments. All first place, second place, third place and honorable mentions receive certificates.